Line Magnetic integrated for sale. This is an SET using the venerable 845 output tube. This is not your grandfathers amp. This is a tube amp with balls that belies its 22 watt per channel. Condition is very good with one flaw on the tube cage shown in the photos. This is a very heavy amp and I would rather not ship. I will as a last resort, but will drive a reasonable distance to deliver. Unless I missed it, where are you located? ...Very nice amp, btw. Sorry, my bad. I am in lynchburg va. But I have the original box and am working on a second one to double box. What is going in it's place? Good question from above. This is an amp that I've actually listened to...it's an excellent amp and a steal at asking price. Yes, it is a great amp. One of the best I've owned. It handily beat a Cary SLI-80 a couple of months ago. And I sold a Conrad Johnson amp when I bought it last year. I bought a Decware Torii II and it is a better match for my klipschorns. I think we've all experienced synergy with components and sometimes it's an unlikely pairing. 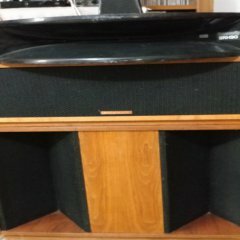 I would really like to keep both amps, but I'm unable to do that. Here is a very accurate review from the Wall of Sound. Pretty much sums it up. I would also be open to interesting partial trades for a nice preamp. You hit the nail on the head there my friend. You just never know for sure until you give it a listen. I sincerely hope somebody here takes a leap of faith here with your 518. It really is a phenomenal amp. Enjoy your tubes and horns. Do you need a phono stage? No, I have a first class phono pre already. I now have this amp packaged so well that even Big Brown couldn't destroy it (although they'd give it a good shot). Original box and packing material enclosed in a heavy duty outer box with plenty of foam around. That is a very good price on an excellent amp. The is the last thing I need but still tempted. This is a *lot* of amp for $2,700 and someone is going to get a beautiful deal. I'm going to post this in another forum I participate with and can't imagine it not moving at this price. Bump for a great amp. Make me an offer, all I can do is say no. I would like to add that at my asking price I will pay shipping and all paypal fees.